The stories of the companions of the Prophet Muhammad are amazing accounts of what it really means to transform and leave the bad in the past. Muslims believe God gives many opportunities to repent from sins. From one prayer to the next, one ablution to the next, one Friday congregation to the next—are just some of the opportunities Muslims have for washing away their sins. Say, ‘O My servants who have transgressed against themselves [by sinning], do not despair of the mercy of Allah. Indeed, Allah forgives all sins..’ (39:53) In the stories of some companions, we see those who were great enemies of Islam experience a change of heart and become role models for the ummah, or Muslim community. What is just as remarkable is the warm welcoming the person receives upon the acceptance of the faith. Previously held hard feelings fall to the wayside immediately, and life starts anew. This is the case for one companion, Khalid ibn Walid. Khalid was a military mastermind and fiercely led armies in battle against the Muslims before his conversion to the faith. He delivered powerful blows to the Muslims, and he was amongst the disbelievers as a brave warrior. WHY DO PEOPLE CHOOSE ISLAM OVER OTHER RELIGIONS? When the Prophet and his companions entered Makkah after many years of not being allowed, they performed a minor pilgrimage called umrah. During this time the Prophet (may the blessings and peace of God be upon him) asked Walid, the brother of Khalid, where he was. Khalid was not Muslim yet at this point, but the Prophet believed there was some good in him. And that because of his intelligence, he would be able to see the truth of Islam. The brother of Khalid wrote all of this in a letter and sent it to him. This letter planted a seed of questions in Khalid ibn Al-Walid. He then had a dream, in which he saw a very dark area that opened up into a green pasture with a lot of light. So, he understood this darkness as disbelief and the light as Islam. He decided to travel to the Prophet and accept the religion. When Khalid ibn Al-Walid reached the Prophet, he was praised. The Prophet told him that he knew he was a man of great intellect and that he hoped for this moment to happen. This scene illustrates how forgiving the Prophet was and how ready he was to befriend even one of his former staunchest enemies. 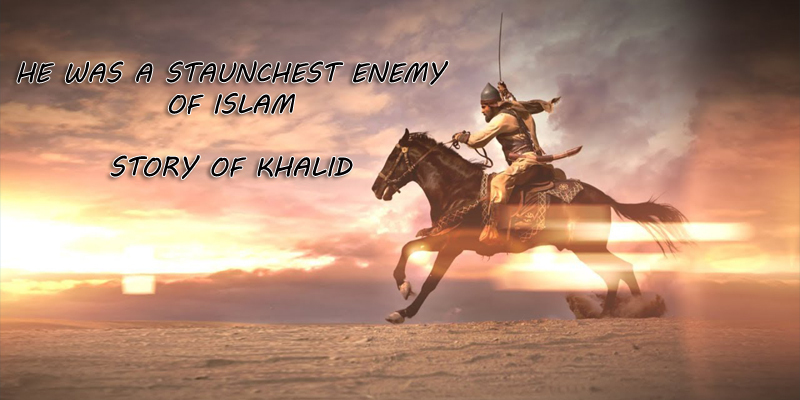 Upon reciting the declaration of faith, Khalid ibn Al-Walid realized he was among people he previously fought against. He asked the Prophet to supplicate to God for his pardon. To this the Prophet (may the blessings and peace of God be upon him) revealed to Khalid that accepting Islam wipes away a person’s previous sins, both big and small. They are reborn with a completely clean slate. This rebirth still applies to this day for anyone who wants to accept the religion of Islam. Becoming Muslim and following the faith is an act that God loves. He grants forgiveness of an entire life of sin. And the opportunity to start fresh is all that a person has in front of them.